Beth Kanter is a leading social media expert for nonprofits. She gives advice on how schools should manage their Facebook, Twitter, and social media efforts. Most schools need more volunteers and donors (or at least positive press). Schools can even motivate students to share positive things. Social media can help if you know how. How should schools spend time on social media? Measure success? How one group found a video with a million views didn’t help get more volunteers and donors. Engage and empower PhilanthroTeens to support your school on social media. Make it easier for volunteers to sign up. Explanation of A/B testing and how it can help your school. Beth Kanter wrote the Networked Nonprofit book series. She is considered a leading expert in the use of social media for social change. Social media is a mindset. Social media is a skill. Social media can help you, not just be a problem. Anyone working with social media in schools should follow Beth. Volunteerspot.com is a free tool that will make it easier to engage potential volunteers and donors. Make parent-teacher conferences easy. Pick the times you can meet. Email/share the link. Parents DON’T need a password or login to sign up. Volunteerspot will remind them. Volunteerspot is easy and FREE! Sign up today. Sign up for Volunteerspot.com now. Listen to this episode with Beth Kanter to learn how to get more volunteers and donors for your school. 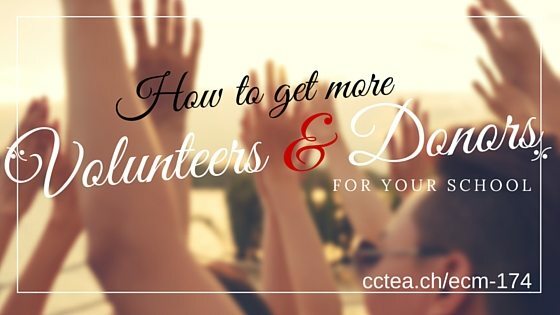 The post How to Get More Volunteers and Donors for Your School appeared first on Cool Cat Teacher Blog by Vicki Davis @coolcatteacher helping educators be excellent every day. Meow!